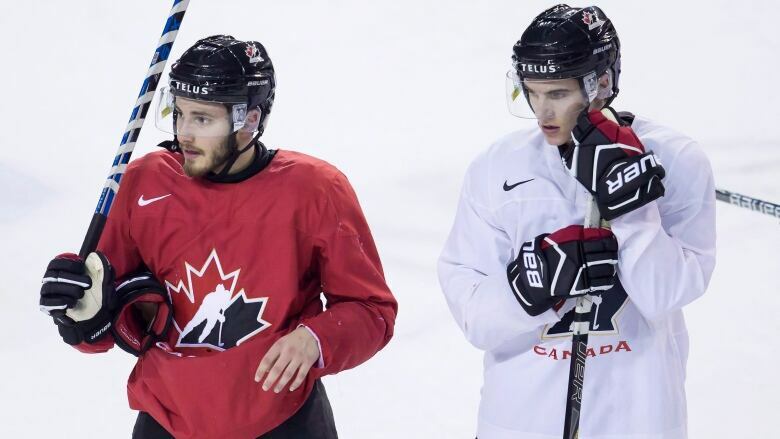 Rookie defenceman Victor Mete has no trouble exchanging his Montreal Canadiens' jersey for Team Canada colours and an opportunity to compete in the World Junior hockey championships later this month. Though the Canadiens placed Mete's NHL career on hold by allowing him to compete for Canada, the 19-year-old was excited to achieve another childhood dream of representing his country. "It's cool to be here now," Mete said Tuesday after arriving for the national junior team's four-day selection camp in St. Catharines, Ontario. "Hopefully I can make the team and win a gold medal because that was probably the biggest thing I wanted since I've been a kid." Mete sensed the Canadiens' decision was coming with their blue line getting healthier and after he was scratched the past two games. "I wasn't really surprised," he said. "Sending me here might have been a good decision. So just trust them." The Canadiens made the move to allow Mete to continue developing on an elite stage rather than have him watch games from the press box. Their only other option would have been demoting Mete to his Ontario Hockey League team in London, because he's not eligible to be sent to the minors. Mete was selected by Montreal in the fourth round of the 2016 draft and enjoyed such an impressive preseason that he made the Canadiens' season-opening roster. At 5-foot-10, he makes up for his lack of size with speed and playmaking ability, and has four assists in 27 career games, while averaging just under 15 minutes of ice time. The 10-nation, two-week tournament is being held in Buffalo, New York, and opens on Dec. 26. What's uncertain is where Mete winds up once his Team Canada duties are complete. "I'm not too sure. I haven't really talked to him about it," Mete said, referring to Canadiens general manager Marc Bergevin. "He probably just wants me to focus on this right now and just kind of see what's going to happen." Mete first has to make the team, with Canada having to cut its camp roster from 33 to 22. Mete adds valuable experience in being only one of two players in camp to have appeared in an NHL regular-season game. The other is forward Alex Formenton, who played one game for Ottawa this season. Mete is particularly motivated after being cut during Canada's selection camp a year ago. "I was a little upset last year," he said. "Now I get the opportunity to make the team and kind of put that behind me." Returning coach Dominique Ducharme is impressed by how much Mete has developed in one year's time. Ducharme also believes the experience of getting cut might have benefited Mete. "He's a great kid. He's a mature young man and we saw that all along," Ducharme said. "But going through those moments is always a positive for a player, and experience you can't buy." Canada finished second last year after a 5-4 shootout loss to the United States in the championship game. Canada leads all nations with 16 world junior titles, but has won just once — in 2015 — since a five-year championship run ended in 2009.